Click the button below to add the Wrestling Whistle to your wish list. Don't be fooled, not all engraved whistles are the same, you would have to read my story to get the full details. Wrestling whistle comes with wrestling graphic. Our wrestling whistle makes a great wrestling coach gift. It is made of high polished stainless steel which gives it a shiny silver finish. The stainless steel makes our wrestling whistle harder to scratch and makes our wrestling whistle last. We engrave the wrestling whistle on the top of the mouth piece so the engraving can be easily seen by others. We can also engrave the back of the whistle, up to two lines of text as show in the picture above. If you want the back of the whistle engraved you must select yes in the Engrave back of whistle option. If you don't, it won't charge you for the extra engraving, and we won't engrave it. There is an extra $3.00 charge for engraving the back. The engraved text on the back of the whistle will be engraved toward the tip of the mouthpiece, as shown in the picture above, it will not be in the center. Since it is a gift for a wrestling coach, we engrave the wrestling graphic as shown above. We engrave two additional lines that you can personalize. For example, you could engrave his or her name in the Text for line 1 box. We also give you a second line that you could engrave a year, date, team name or anything else that would make their whistle more special to them. If you only want one line engraved we will center the one line of engraving, just enter your text in the Text for line one box. If you want two lines engraved we will center the two lines of engraving, just enter your text in the Text for line one box and Text for line two box. We don't engrave in all capitals. We always use upper lower case letters to save on space. Measures 2 1/4" x 1". So to order your wrestling whistle, just fill out the personalization options and click on the Add to Cart button. If you are ordering more than one, you will need to click the Add to Cart button for each whistle that is being ordered. 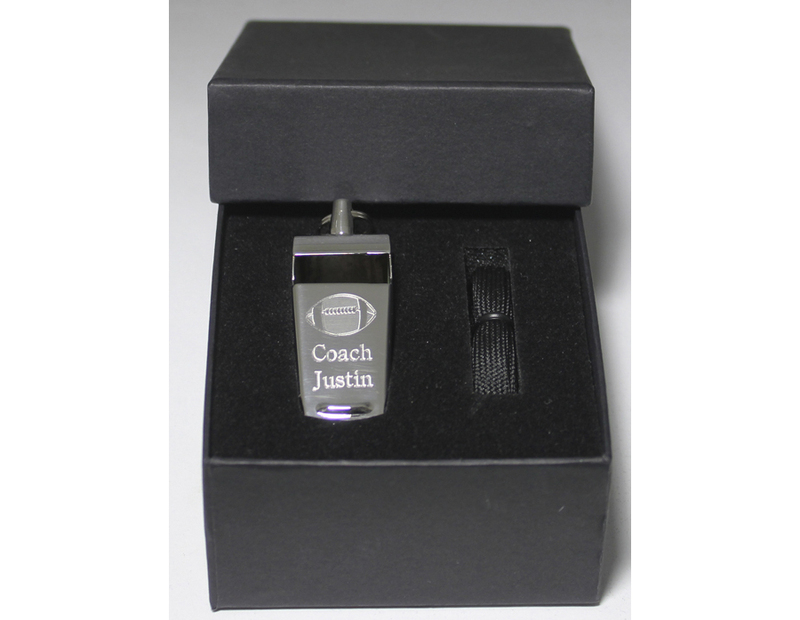 If the engraving is going to be the same for all the whistles you need to order you will only need to click the add to cart button once, and when you get to the shopping cart, just change the quantity to the number that you need to order. When you change the quantity, the shopping cart will update the price. You will get an email as soon as you place your order to let you know what you ordered. Please look over this email and make sure everything is correct. Check to make sure the engraving is spelled correctly, If something needs to be capitalized, make sure it is. Check the shipping address and zip code to make sure they are correct. Also check to make sure your email address is correct. If you do not get an email, contact us to make sure we got your order. Its that easy. Once your wrestling whistle is engraved and shipped you will receive an email letting you know that it was shipped and the tracking number. If your order is placed: Monday - Friday 10-3 and Saturday before 10:30am we try to engrave and ship it the same day. Any orders that we get after 10:30am on Saturday will not be shipped until Monday night. We ship your wrestling whistles United States Postal Service. We have two options. The $5.95 rate is for Priority Mail. It will take 2-5 days for you to recieve your order. We also ship Express Mail. There is a $25.00 dollar charge for this service. You will get your package in 1-2 days. 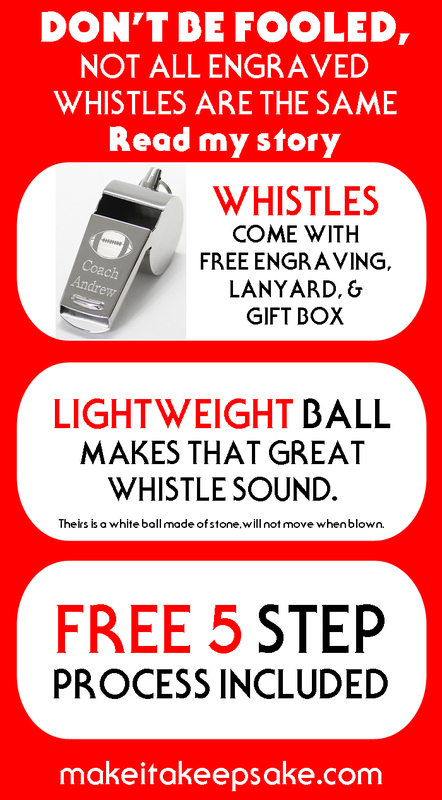 To order our coach whistle without graphic. You may also like our Wrestling Keychain. Great for coach gifts and team gifts. Make sure to check font chart below for instructions on what order to put the initials in. Each font is different. Also enter in all capitals only if that is the way you would like it. Remember we will engrave as shown, this includes punctuation, capital letters, upper lower letters,etc. We will engrave in the order that you have entered. Please check all engraving to make sure it is correct. We will correct any mistake made by us for no charge on the exact item however, if it is your fault then we will engrave another same item with the correct information for 50% off of the regular price of the item (not 50% off of a sale price). No returns or refunds on engravable items. Great looking & sounding whistle! Sharp graphics and lettering. The whistle comes nestled in a fantastic box that makes it all ready to wrap and give! The wrestling whistles and service were phenomenal! Coaches loved them! We will be repeat customers. This is the perfect gift! Our wrestling coaches loved them! I needed them quickly, and they were easy to work with. So much appreciated! We will be repeat customers! It's hard to find wrestling items, and this is great. The engraving is clear and you can see it well. Does not look cheap like some engraving out there. We loved the wrestling graphic also. Makes a great gift.